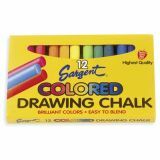 12 assorted colored drawing chalks for use with paper. Great colors, easy to blend. Comes in its own sleeve package. Ideal for everyone, from beginner to fine experienced artist. Excellent for scrapbooking or aged effects on paper. Soft, user friendly formula allows superior color control. Comes in an easy to use lift lid box. 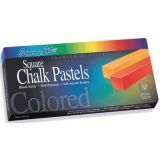 Square chalk stick size is 2-1/2" x 3/8". 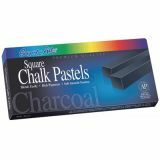 These pastels offer a velvety smooth dry texure, with brilliant, concentrated pigmentation. A softer style medium. 12 colors per lift lid box.